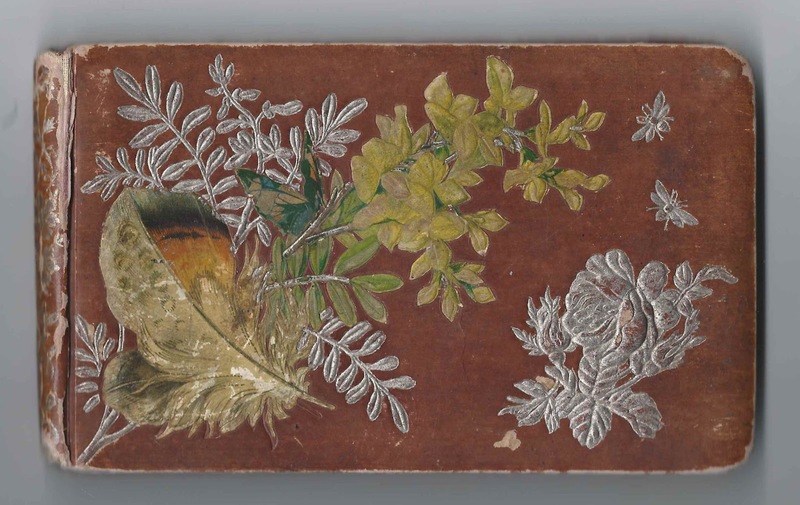 1885-1916 autograph album that belonged to Joseph Hartley Sabean, who went by "Hartley", of New Tusket, Nova Scotia. 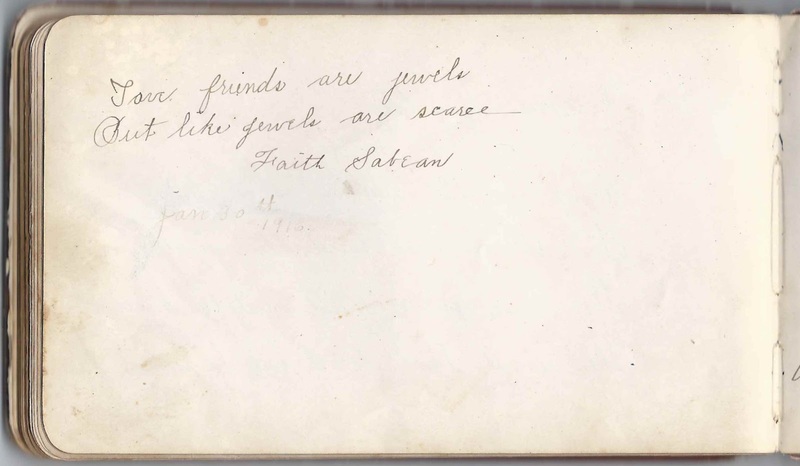 Most of the autographs date from the 1880s, but Hartley's daughter, Faith Saunders Sabean, signed in 1916, and Faith's daughter Phyllis L. Vaters, signed in 1949. 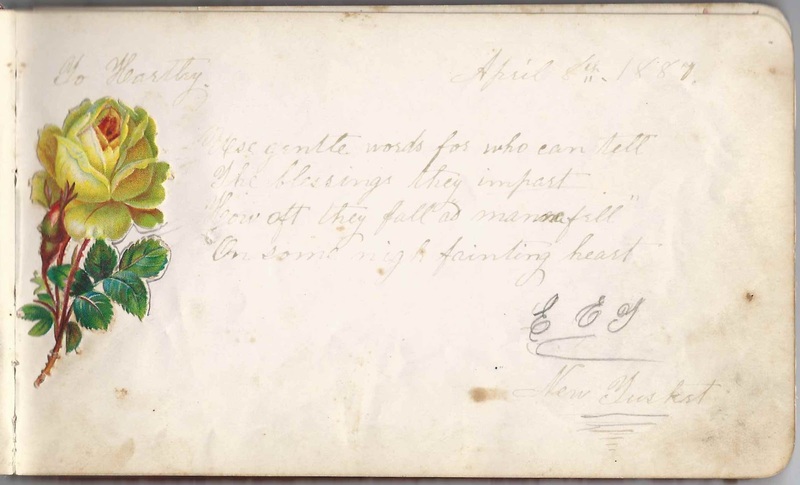 The album is approximately 7-1/4" x 4-1/4" and contains the sentiments of over 40 of Hartley's relatives and friends. An alphabetical list of the senders appears at the end of this post. Joseph Hartley Sabean, "Hartley", was born 16 February 1860 at New Tusket, Nova Scotia, the son of Henry Charlton Sabean and Mary Ann (Randall) Sabean. His father was a farmer, a postmaster and a deacon. 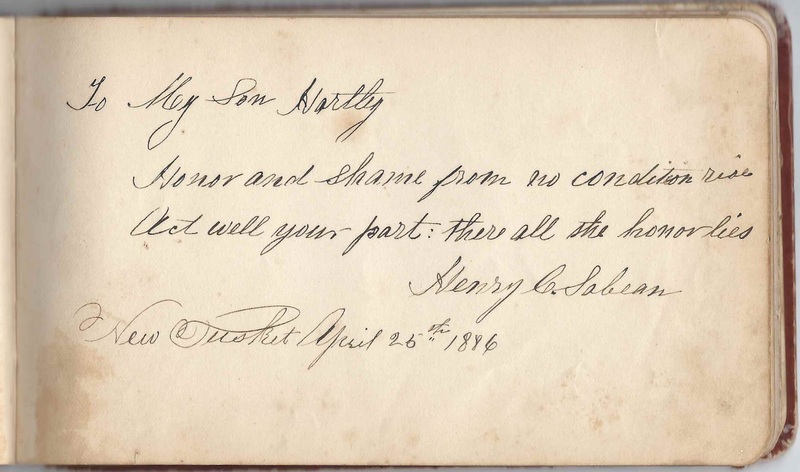 Hartley's father signed a page in the album at New Tusket, Nova Scotia, on April 25, 1886. I think the M. A. S. who signed a page was Hartley's mother Margaret Ann (Randall) Sabean. 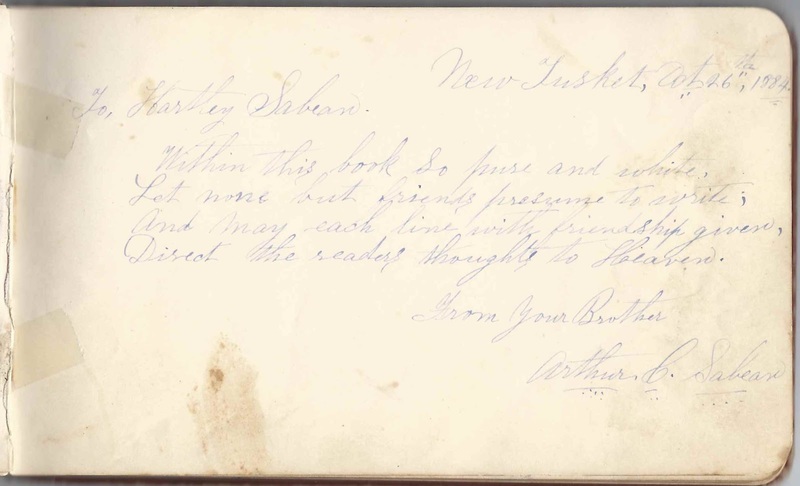 Hartley's brother Arthur Crawley Sabean signed a page at New Tusket, Nova Scotia, on October 26, 1884. 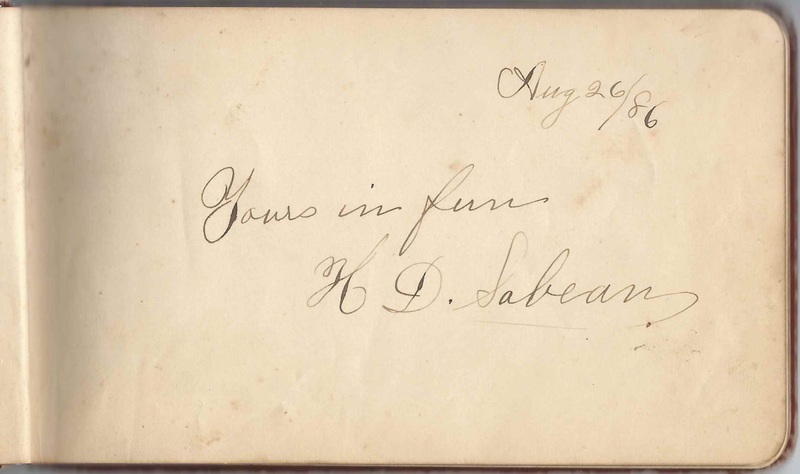 I believe the H. D. Sabean who signed a page on August 26, 1886 was Hartley's brother Henry Dwight Sabean. 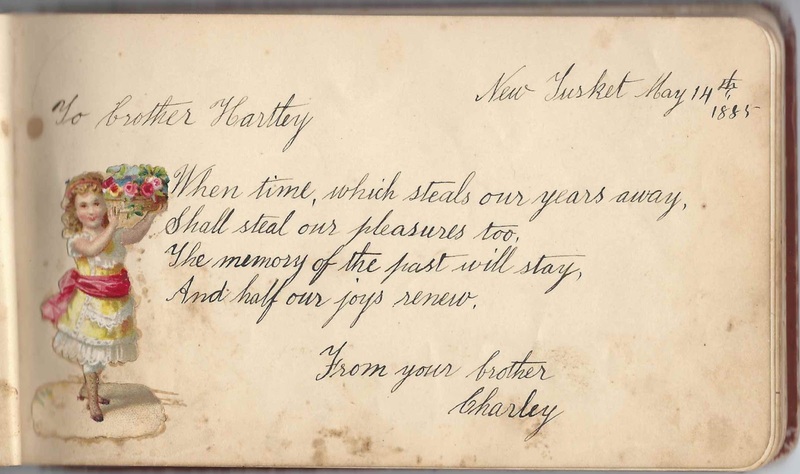 The Charlie who signed a page at New Tusket, Nova Scotia, on May 14, 1885 was Hartley's brother Charles Franklin Sabean. 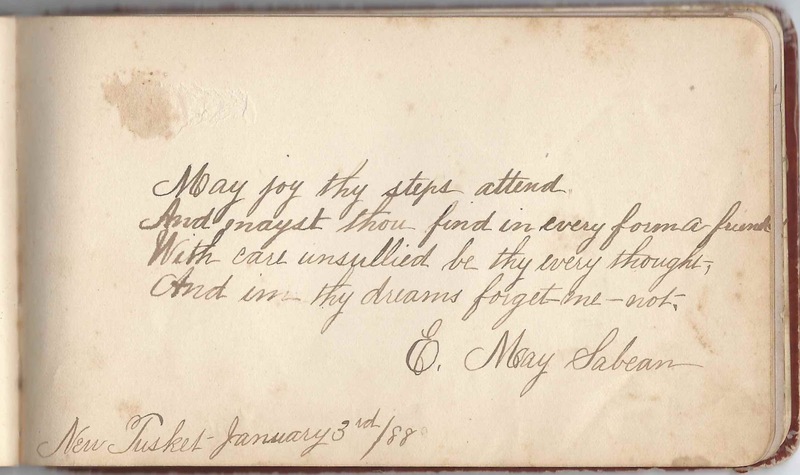 The E. May Sabean who signed a page at New Tusket, Nova Scotia, on January 3, 1888, was Hartley's sister Ella May Sabean. On 15 December 1890 at New Tusket, Nova Scotia, Joseph Hartley Sabean married Elizabeth Eudora Tedford, daughter of Clement and Frances (Shaw) Tedford. 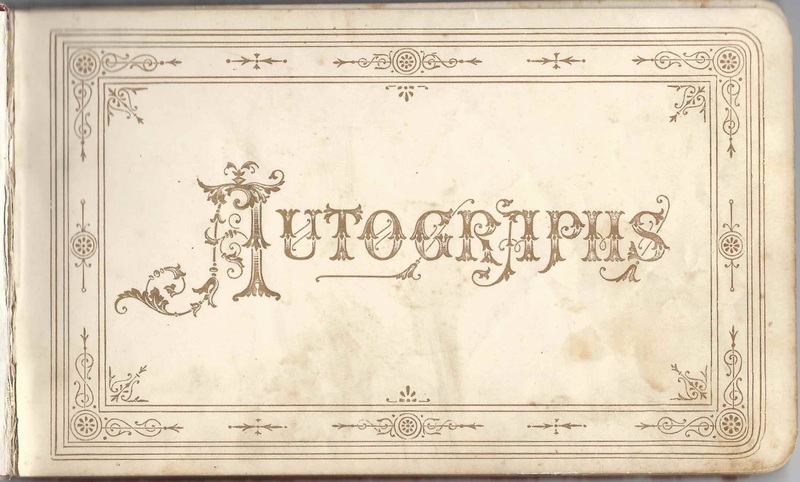 Interestingly, the first signed page in the album was inscribed to Hartley by E. E. T. at New Tusket, Nova Scotia, on April 8, 1887. It's very tempting to think that E. E. T. might have been Hartley's future wife Elizabeth Eudora Tedford. Hartley and Elizabeth farmed at New Tusket, Nova Scotia, and raised, I think, four children. 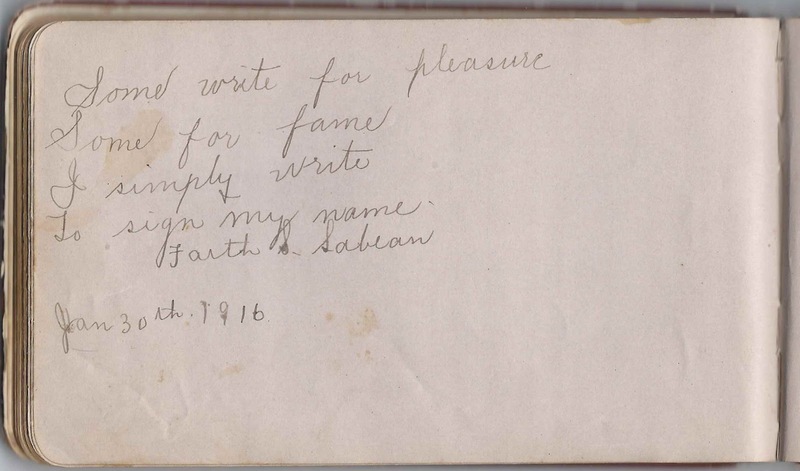 One of their children, daughter Faith Saunders Sabean, signed two pages on January 30, 1916. 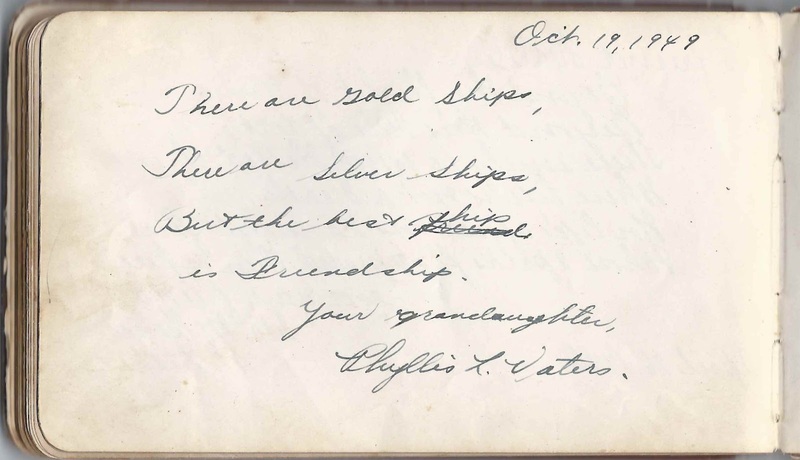 Faith Saunders Sabean married Cecil Edison Vaters and had at least one child, a daughter Phyllis, who signed a page in her grandfather's album on October 19, 1949. About 1920 Hartley and family moved to Everett, Massachusetts. Hartley was naturalized on 10 October 1927. He was still working at the age of 80 as a janitor, as noted in the 1940 Census of Everett, Massachusetts. He died in 1950. Charley, signed at New Tusket, Nova Scotia, on May 14, 1885; Joseph Hartley Sabean's younger brother Charles Franklin Sabean. E. May Sabean, signed at New Tusket, Nova Scotia, on January 3, 1888. Possibly Ella May Sabean, Joseph Hartley Sabean's younger sister. E. E. T. of New Tusket, Nova Scotia, signed on April 8, 1887. Presumably Elizabeth Eudora Tedford, whom Joseph Hartley Sabean would marry on 15 December 1890 at New Tusket, Nova Scotia. You have such a great treasure! 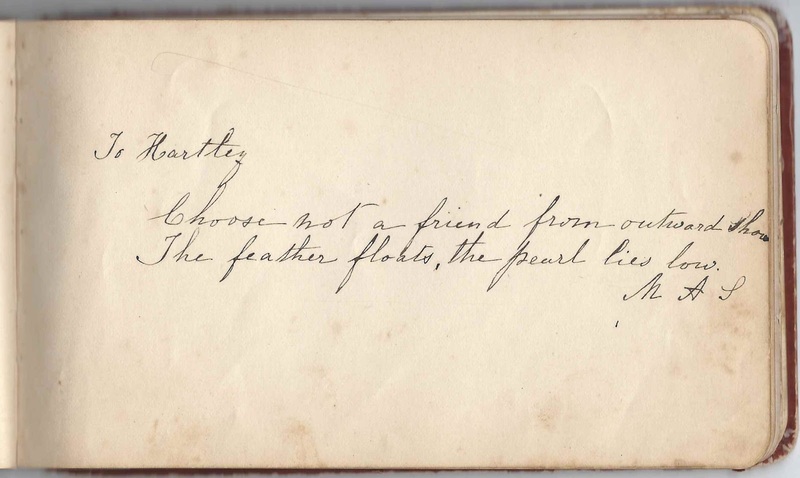 My 87-yr. old mother was delighted to see a picture of her father's handwriting (Arthur Crawley Sabean). Myself, I grew up hearing stories, or names mentioned, of Uncle Hartley, Uncle Charlie, etc.